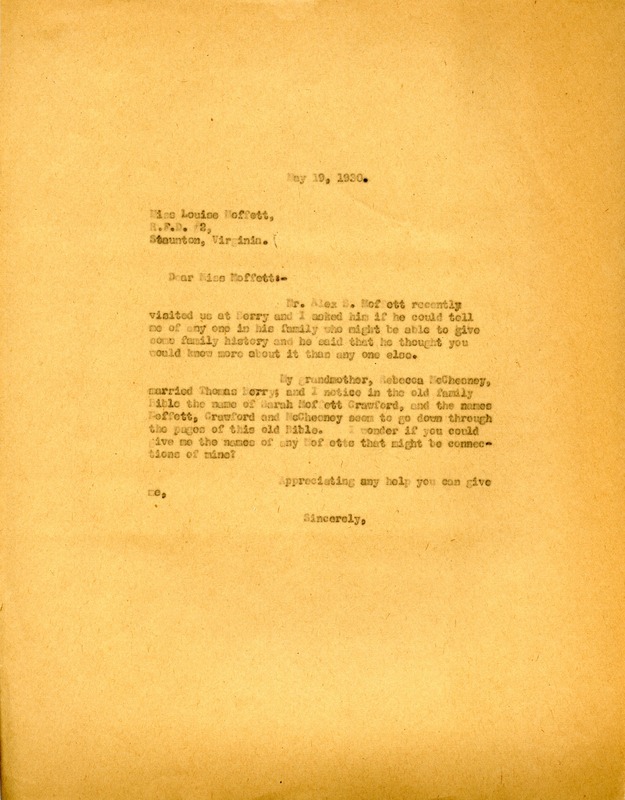 Martha Berry writes to Miss Moffett in hopes of uncovering some family history. She writes of her her Grandmother Rebecca McChesney, her Grandfather Thomas Berry, and Sarah Moffett Crawford, a name in the Berry family bible. Martha Berry, “Letter from Martha Berry to Louise Moffett.” Martha Berry Digital Archive. Eds. Schlitz, Stephanie A., Emilee Sargent, Amanda Mays, Christy Snider, Angela McCavera, et al. Mount Berry: Berry College, 2013. accessed April 20, 2019, https://mbda.berry.edu/items/show/13444.